I’ve been in a bit of a book funk the last few weeks and was desperately, urgently in need of a fast and addictive read to lift me out. So, I did what I usually do whenever I find myself in these kinds of situations: I picked up a thriller. 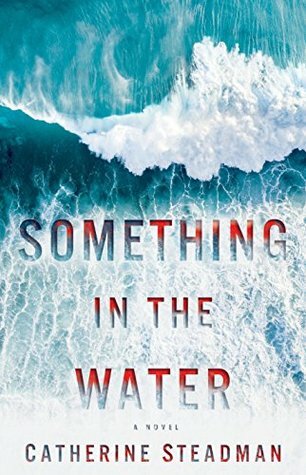 As a subgenre of mystery, the category of domestic suspense seems to be rising in popularity lately, and Something in the Water is the newest kid in town that everyone’s been talking about. Following a newlywed couple, the story opens with scene to remember: Erin, a young up-and-coming documentary filmmaker, is busy digging a grave while her husband Mark lies quiet and still a few feet away. The rest of the book is told in flashback as Erin ruefully recalls the series of turbulent events that have led them both to this harrowing moment. Just a few short weeks ago, the happy couple were in Bora Bora on their honeymoon, trying to get the most out of their time on the tropical island before returning home to Britain. Erin is in the middle of working on a documentary on prisoners returning to their normal lives after incarceration, and one of her subjects is a high-profile crime lord whose involvement would give her new film plenty of much needed publicity once it’s finished—but only if everything goes as planned. However, Mark has just lost his job, and right now no one seems to be interested in hiring an investment banker. With the expenses on their lavish wedding and mortgage on their expensive home still needing to be paid, the couple’s finances are a bit stretched at the moment. In addition, both are eager to start a family, so they’re also trying for a baby. Still, even with all the uncertainty in their lives, Mark and Erin are madly in love and determined to focus only on each other while they are in paradise. They spend their days lounging, hiking, and taking in the local culture. Mark, a licensed diver, even convinces Erin to join him in some scuba diving. Then, while on one of these trips out onto the crystal blue waters, something thunks against their boat. And what they find changes everything. One of the key features of a domestic suspense is its focus on ordinary people caught up in extraordinary circumstances, which perfectly describes Erin and Mark’s situation. Their discovery in Bora Bora leads them down a path neither is prepared or equipped to navigate. In fact, one of the biggest joys—and frustrations—of this book was watching Erin stumble her way into one mistake after another, and I do mean this in the best possible way. After all, she’s in so deep over her head that it’s difficult not to sympathize even when she makes some monumentally boneheaded mistakes, for I doubt many people would be any less clueless if they ever found themselves in her circumstances. Obviously, I can’t say much more about the plot because I absolutely do not want to spoil a thing, and truly, the less you know going into Something in the Water the better. Reading this novel though, it was easy to connect with the characters because they are so incredibly believable, even in all their rapacity and naivete. One might even point out that Mark and Erin’s foibles make them feel more genuine. I for one loved how each and every one of their decisions made me ponder what I would have done in their shoes. Would I have done things differently? Would I even be able to keep my cool and think rationally through such a bizarre and stressful situation? This story kept me on my toes from beginning to end, filling me with equal parts curiosity and anxiety as I watched the consequences of the characters’ decisions play out. There were a lot of details to pay attention to, but the narrative also flowed at a fast and exciting pace, keeping up the high levels of suspense. All in all, I was very glad I picked up Something in the Water because it definitely cured me of my book funk, filling me with a renewed energy following a recent string of unexceptional, middle-of-the-road reads. It’s actually quite impressive for a debut. While it wasn’t perfect, all the elements you want in a thriller are there and I never found myself bored. If you’re looking for a good psychological thriller this summer, I highly recommend this one. Audiobook Comments: I don’t watch Downton Abbey, so I had no idea who Catherine Steadman was or that she’s an accomplished actress until I started listening to the audio of Something in the Water and realized she narrated her own book. Usually that would make me nervous, but as soon as I heard Steadman read I knew that she had to be a professional, prompting me to look her up and discover her acting credits. She was simply phenomenal, delivering a five-star performance. Now I know that in addition to being a great author, she’s also a fantastic actress who is proficient in a wide range of accents and is versatile enough to adapt to any character role. Yeah, palate cleansers is a great way to describe them! This one definitely hit the spot. The less you say, the more I’m intrigued by this story! But I imagine that was your goal all along… 😉 And how could I resist a book with that kind of opening? To be honest I am not a fan of books that start like that cos I am all but I know what happens! This one sounds intriguing and I might consider picking it up. Thrillers can be so hit or miss for me but I have had better luck with them this year so far. Sounds to me like Mark and Erin needed to put on the brakes – they seem to want everything at once! Glad this got you through your funk! Yeah, I remember how you had a bad run of thrillers where you were disappointed. Glad to hear you’ve been having better luck with them recently! I do like the sound of this one and I’ve read a couple of other positive reviews so will add it to my wishlist.